Metallbau Emmeln has been a respected manufacturer of custom-made containers since the 1980s. Simple cargo boxes for bulk goods and standard housings for industrial machinery were once our major products, but over the years our assignments have become more and more specific. Originally a sideline for the company, which only manufactured leisure park rides when established in 1968, container customisation is now responsible for 50%-60% of the company’s sales. Requirements for environmental compatibility and health and safety regulations have become increasingly important over the last few decades. Specifications for our containers have been newly defined again and again. Containers with dimensions following ISO standards (such as cargo containers) are easy to handle and transport. Containers that are rarely moved can have different dimensions. Our production facilities and location allow Metallbau Emmeln to manufacture units up to 5m high and 7m wide. These oversized units are transported via the inner harbour Eurohafen. Our largest ever container assembly was 24m x 9m x 5.1m (empty weight approximately 100t). Switch gears require dry and tempered surroundings, while control systems increasingly feature safety functions. This means that permanent operation must be ensured. We achieve this using tight closed boxes, ventilation and air conditioning. Permanent availability is often provided by large battery racks; batteries may require solid floor structure and acid-tight drain trays. Internal cabling between switchboards can be hidden in a false floor or in cable ducts underneath the ceiling. External cables are sealed within MCTs (steel frames in standardised sizes), which are integrated into the walls or floor. Insulation not only retains interior warmth or coolness, but also provides fire protection. Fire-proof housings are needed in many industry branches, often in combination with other requirements. Nearshore and offshore sites demand the highest standard of corrosion protection. From simple two-layer coatings without surface preparation for reduced rust, to more demanding applications, Metallbau Emmeln offers a wide range of corrosion-protection systems. Offshore operation presents the toughest challenge for materials. The importance of mechanical strength will be familiar to anyone who has seen an offshore crane loading or landing under extreme conditions. Collision with the ship’s structure, other containers and goods must not disturb or damage the unit. Offshore climate means high humidity, near-permanent wind and high salt content in the air, which leads to rust and corrosion if a surface is not 100% protected. Even the smallest cracks in paint surfaces will soon lead to damage. Since its formation in 1968, Metallbau Emmeln activities comprise construction, manufacture and distribution of games and leisure facilities, as well as access and control systems. Metallbau Emmeln manufactures ISO standard-sized aggregate containers, as well as all intermediate sizes up to maximum transport sizes. 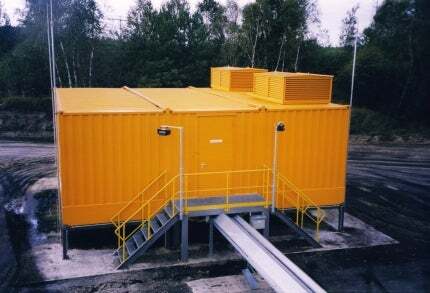 Offshore containers are used to transport goods and for the enclosure of machines, systems and controls as storage space for the accommodation of people on oil and gas rigs, as well as on substations for wind turbines, or other equipment used at sea. Metallbau Emmeln’s containers, which are developed for various switch gears, offer several advantages for plant construction. Metallbau Emmeln's transformer containers are individual in size, have multiple applications and can be used for various room separations.